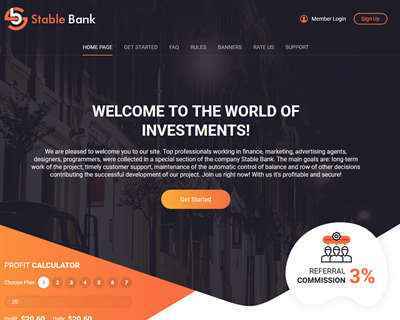 Stable Bank - stable-bank.club | Slivsell - Библиотека курсов. Лучший слив инфопродуктов в России! Тема в разделе "HYIP от 61% в месяц", создана пользователем All-HYIPs.info, 20 мар 2019. 23.03.19 07:11;Account;Receive;Received Payment 11.1 USD from account U20519481 to account U1294000. Batch: 252245895. Memo: API Payment. Withdraw to allhyips from Stable Bank. 23.03.19 07:11;Account;Receive;Received Payment 6.00 USD from account U20519481 to account U1294000. Batch: 252245885. Memo: API Payment. Withdraw to allhyips from Stable Bank. Выглядит симпотно, но посмотрим до понедельника как платить будет а там и определимся! 25.03.19 07:50;Account;Receive;Received Payment 21.6 USD from account U20519481 to account U1294000. Batch: 252507415. Memo: API Payment. Withdraw to allhyips from Stable Bank. 24.03.19 08:19;Account;Receive;Received Payment 6.6 USD from account U20519481 to account U1294000. Batch: 252382358. Memo: API Payment. Withdraw to allhyips from Stable Bank. 24.03.19 08:18;Account;Receive;Received Payment 15.6 USD from account U20519481 to account U1294000. Batch: 252382225. Memo: API Payment. Withdraw to allhyips from Stable Bank. The amount of 7.5 USD has been deposited to your account. Accounts: U20519481-> U3869878. Memo: API Payment. Withdraw to hyiper_net from Stable Bank .. Date: 07:51 03.25.19. Batch: 252507515. 26.03.19 07:35;Account;Receive;Received Payment 13.5 USD from account U20519481 to account U1294000. Batch: 252657540. Memo: API Payment. Withdraw to allhyips from Stable Bank. 03.28.19 08:09 Account Transfer -200.00 Sent Payment: 200.00 USD to account U19335710 from U4731311. Batch: 252958803. Memo: Shopping Cart Payment. Deposit to Stable Bank User monitorinvestnet. 28.03.19 07:49;Account;Receive;Received Payment 6.00 USD from account U20519481 to account U1294000. Batch: 252956491. Memo: API Payment. Withdraw to allhyips from Stable Bank. 27.03.19 07:55;Account;Receive;Received Payment 12.00 USD from account U20519481 to account U1294000. Batch: 252811041. Memo: API Payment. Withdraw to allhyips from Stable Bank. 27.03.19 07:54;Account;Receive;Received Payment 5.4 USD from account U20519481 to account U1294000. Batch: 252810695. Memo: API Payment. Withdraw to allhyips from Stable Bank. The amount of 7.5 USD has been deposited to your account. Accounts: U20519481-> U3869878. Memo: API Payment. Withdraw to hyiper_net from Stable Bank .. Date: 08:01 29.03.19. Batch: 253099386. 29.03.19 07:59;Account;Receive;Received Payment 12.00 USD from account U20519481 to account U1294000. Batch: 253099198. Memo: API Payment. Withdraw to allhyips from Stable Bank. 03.30.19 07:47 Account Receive +6.00 Received Payment 6.00 USD from account U20519481 to account U4731311. Batch: 253223809. Memo: API Payment. Withdraw to monitorinvestnet from Stable Bank. 08.04.19 08:58;Account;Receive;Received Payment 6.00 USD from account U20519481 to account U1294000. Batch: 254813370. Memo: API Payment. Withdraw to allhyips from Stable Bank. 10.04.19 09:07;Account;Receive;Received Payment 6.00 USD from account U20519481 to account U1294000. Batch: 255144015. Memo: API Payment. Withdraw to allhyips from Stable Bank. The amount of 42.3 USD has been deposited to your account. Memo: API Payment. Withdraw to naale from Stable Bank.. The amount of 36.3 USD has been deposited to your account. 11.04.19 08:08;Account;Receive;Received Payment 6.00 USD from account U20519481 to account U1294000. Batch: 255298879. Memo: API Payment. Withdraw to allhyips from Stable Bank. 12.04.19 08:16;Account;Receive;Received Payment 6.00 USD from account U20519481 to account U1294000. Batch: 255462607. Memo: API Payment. Withdraw to allhyips from Stable Bank.